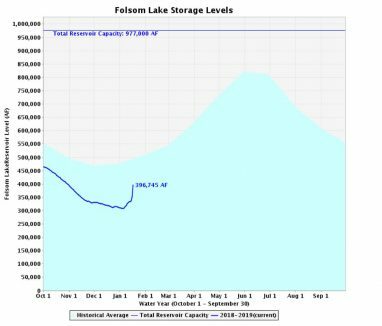 California Department of Water Resources graphs shows Folsom Lake’s water level has risen by over 88,000 acre feet in the past two weeks. To put it in perspective, that’s about 4 times what the city of Folsom uses in one year. While the lake stands at about 42% of capacity, considerably below average for this time of year, with more storms underway, and the Sierra snow pack at 103% of average, these are good signs that the lake is on the rebound.